Bloodlet Throne is a single level fort occupied by vampires, vampire thralls, and wolves. Bloodlet Throne is not an easy place to find as the path leading up to it has crumbled and it is largely hidden. To get there, follow the path going east out of Falkreath; you will see a marker that leads up to Peak's Shade Tower. Continue on the main path going east and shortly after you pass underneath the bandit-ridden overhanging bridge you will see another marker to your right. Follow it up and you will see a stream coming out of a waterfall. Be mindful as you pass this stream; there is a small bandit campsite to the left, and they have a habit of patrolling the road. Turn right past the stream; your road is to the west. The path then winds up the mountain with markers along the way. There will come a point where it will seem that you cannot go up anymore next to an abandoned campsite (Ancestor Glade, if Dawnguard is installed). At this point, backtrack a few steps until you can go further south again. The path will become clear once more, and this will ultimately lead you to the Bloodlet Throne. There is, however, an easier way of reaching it. If you fast travel to Fort Neugrad, your destination becomes much easier to reach. Pass Fort Neugrad on the path leading southwest, and it should take you nearly directly to Bloodlet Throne. 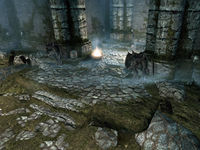 With Dawnguard installed, gargoyle statues are added to the interior, several of which do reveal themselves as hostile enemies. Additionally, the wolves in the arena section may be replaced by death hounds. One iron ore vein can be found early on in the snow. One silver ore vein can be found after defeating the Master Vampire and passing his thrones. One quicksilver ore vein can be found outside, 120 ft south of the entrance. A second quicksilver ore vein is located the same distance again to the southeast. The approach is generally from the northeast along the path described above. It consists of a single story square fort with a ruined tower on top. You can access the top of the fort from the outside as the snow has piled up at the rear to enable you to walk up. Inside the ruins of the tower is an unlocked chest and a small square wooden table holding a quiver of iron arrows and a random enchanted bow. There are numerous snowberry bushes around the fort. In front is the entrance with blood splattered on the ground outside. To the right are three unusable barrels and next to them is a wood chopping block and empty cart. Upon entering you are in an empty room with a doorway in front of you. In front of the doorway is an easily missed pressure plate that activates flame spouts on either side of the doorway. Through the doorway is a corridor with crates and barrels strewn everywhere. You can hear someone speaking ahead. The corridor turns to the north and there are bars on your left. Through the bars you can see a vampire and vampire thrall talking. Keep quiet to avoid detection or use a bow to snipe them from here. Beside the bars is a dresser, but nothing interesting. Just past the barred section the corridor turns to the west and stairs descend into the room with the two vampires. From the top of the stairs you can see two gargoyle statues, one on either side of a large archway as well as two lit braziers. There are two oil lanterns hanging from the ceiling and an oil slick below the bars that can be used to kill the guards. There is a wooden door to the south, but it is barred from the other side. As you approach the gargoyles, the one on the left will burst to life. Past the arch is an area with shackles on each of the three walls and human bones littering the floor. There is also a wooden bench against the west wall. Under the bars is a corridor heading east to an open wooden door and stairs heading down, you can hear someone speaking ahead. At the bottom of the stairs the corridor turns to the north and enters a large room containing a vampire on the right. On your left there is a wooden block with a leather strip and iron dagger on top. Against the west wall is a dresser, on top is a candlestick and copy of The Wolf Queen, v5. On a raised area to the right is an end table and a bookcase containing a deathbell, a frost mirriam sample, a potion of plentiful healing, a potion of minor stamina, a potion of plentiful magicka, a potion of minor healing, two bowls of bone meal, a bulb of garlic, a tomato, a bleeding crown fungus and two sacks. 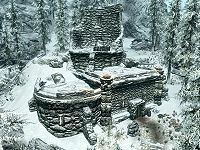 On your right as you enter is a bench against the east wall, and to the left on a matching raised area is another end table with a bowl on top, and also a second bookcase containing copies of A Dance in Fire, v3, The Song of Pelinal, v2, The Bear of Markarth, Yngol and the Sea-Ghosts, Spirit of Nirn, Antecedants of Dwemer Law, an imp stool fungus and two sacks. In the center of the room is a small round wooden table and two chairs; on the table are two wooden plates containing eaten human hands. There is a snowy tunnel heading north from this room and then bearing west. The tunnel is lit by two braziers on stands. At the far end is a cave with a wooden ramp in front of you leading up, and to the right of this is an iron ore vein. At the top of the ramp are two openings through into a huge cavern with a wooden structure and ledges around the room. There are several vampires and vampire thralls in this cavern, so caution and sneak ranged kills are advised. On a ledge to the left above you is a vampire thrall. There is a ramp down to the cavern floor on your left, with a small one back up slightly to the main floor level. There is a stack of barrels on your right, three of which can be looted for ingredients, and a lit brazier and a stack of crates and a sack in front of you. To the left of the barrels is a shallow pool of water with a skeleton floating in it that can be looted. A vampire is wandering the cavern floor, with a second sat at a long wooden table with two chairs to your right. The table is filled with the gory remains of a meal, and there are blood splatters all around the table - messy eaters! To the right of the table is a set of shelves containing copies of The Wolf Queen, v4, The Bear of Markarth, Uncommon Taste. It also contains an apothecary's satchel, a cast iron pot with a potato inside, a draught of health, a potion of health, a draught of extra magicka, two bottles of wine, a sample of snowberries, and a sample of lavender. There are more blood splatters on the ground. There is another wooden ramp leading up in the western corner of the cavern. At the top of the ramp is a small cage. The cage door is novice-locked and contains the body of a Khajiit, unless they were raised during the fight, a deathbell and blood splatters over the floor of the cage. To the right is a lit brazier with a crate to the right of that. On the crate is a woodcutter's axe with an arcane enchanter beside it. On the right is another ramp up and a cart full of human bones. Torches light the way as you climb the ramp. At the top is a ledge with crates and clutter and also a path to the north with a gargoyle statue to the right. To the right of the gargoyle that will burst to life when you approach are a couple of barrels, one of which has a goat hide on top. 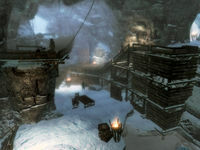 You are at the same height as the first ledge seen with the vampire thrall; the ledge is connected to another via a wooden bridge. The second ledge is above the cage to the west. Any noisy fighting will alert more vampires from here. The path enters an icy tunnel and heads to the west-northwest and is lit by a succession of braziers on stands. It opens into a collection of small areas. The first is on your right and contains an alchemy lab in the middle with two sets of shelves around it. The first set of shelves contains copies of The Book of Daedra, Antecedants of Dwemer Law, Ancestors and the Dunmer, a potion of vigorous healing, a random potion, a mead barrel, and a sack. The second set of shelves contains a random potion and copies of The Oblivion Crisis, Dunmer of Skyrim, Song of the Askelde Men, The Real Barenziah, v4, Argonian Account, Book 3, and another mead barrel. There is a long end table further along with the base of a shrine on top. Passing this in front of you is an icy tunnel to the southwest with an opening in front to the west, where you can see cages hanging from the ceiling, a square cage containing a wolf, and to the north, a gated opening with an adept lock. 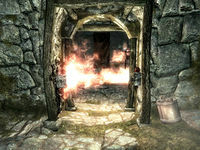 Through the adept-locked gate is a small room with crates, sacks, barrels, and a small square wooden table holding a random enchanted dagger, a filled soul gem, a medium coin purse, a random health potion, two random poisons, a scroll of Blizzard, a scroll of fury, and a copy of the Illusion skill book Incident at Necrom. One of the barrels contains ingredients, and both have sacks on top; there is an unlocked chest to the left of the barrels. There is a second adept-locked gate to the west. This opens into a bedroom area with two vampires sleeping, one in a double bed against the west wall, and the other in one of two single beds against the north wall. There is a set of shelves on your right as you enter containing copies of Antecedants of Dwemer Law, Spirit of Nirn, Biography of Barenziah, v2, The Wolf Queen, v5, and Gods and Worship, as well as a filled random soul gem, a flute, and a leather strip. To the left are the single beds with a long end table between them. On the end table is a potion of minor stamina, a potion of plentiful healing, a scroll of calm, a scroll of fear, a medium coin purse, and an iron dagger that might have fallen on the floor. At the end of the double bed is an unlocked chest, and behind the head of the bed is a set of shelves containing copies of The Cake and The Diamond and Vernaccus and Bourlor, as well as a sample of snowberries and one of lavender. The south end of the room contains the cages seen previously. There are three small cages hanging from the ceiling, one of which has the gory remains of a human, and the square cage, which contains a living wolf. This cage is apprentice-locked. The icy tunnel that heads to the southwest is lit by a string of braziers on stands and leads to an area with a waterfall down the wall to the south, two rock pillars supporting the ceiling, and the path turning to the northeast. This was one of the two ledges joined by a wooden bridge above the first huge cavern. Crossing the bridge, there is a basket containing three pieces of firewood and a bucket containing an iron mace. The path turns to the south and descends to raised spears blocking access to an arena-styled area; the chain to lower the spears is on your right. 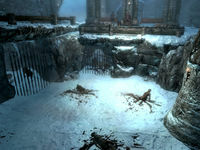 The arena area has two further blocked areas with death hounds or wolves trapped behind them. There are also some dead bandits that have obviously been made to fight and lost. Opposite and above where you enter is a throne with the master vampire sitting where they can oversee the fights below. There is a second vampire sitting to his right on a bench. To your right is another set of raised spears blocking access to an earthen ramp leading up to the master vampire; the chain to lower the spears is to the right. If you are seen before lowering these spears, the master vampire will lower the two sets of spears holding in the death hounds or wolves, releasing them to attack you. The lever for those spears is beside the master vampire's chair. Around the chair and benches are many more human bones. There is a third plain wooden bench on the east side of the ledge overlooking the arena area. An icy tunnel heads away from this area to the southeast. Where it turns to the northeast is a silver ore vein. Where the ice ends is the master-level chest, and to the right is a corridor that leads to the barred door found in the first room for a shortcut out.